If you have a electronically controlled fuel injected sportbike bike, and older carbureted model or an American V-twin with a better flowing Mikuni HSR carburetor, whether the engine is left stock or, most importantly if you are running a modified or high performance tuned exhaust system, you should adjust the bike's computer to take advantage of the potential performance gains. In particular, bikes with slip-on performance mufflers and full race exhaust systems may actually produce less power without the needed changes to their ignition curve and fuel injection mapping to take advantage of improved intake and exhaust tuning flow. 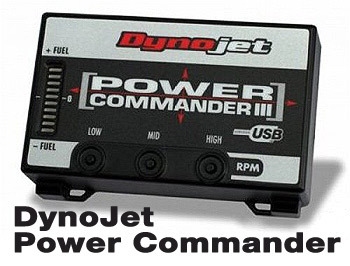 The Power Commander III USB is newly introduced in 2003 and utilizes the same "direct injector control" technology as the PCIII. The USB port provides an instant, no hassle way to connect the Power Commander module to a computer. This model also features an expansion port for add-on ignition modules. The PC is a fuel injection and ignition timing (on some models) adjustment unit that plugs "inline" with the bikes' stock ECU. The PC uses original equipment style connectors so that no splicing or cutting of the harness is required. Most installations take less than 15 minutes, some as little as 5 minutes. Changes are made to the bikes fuel and ignition curves via the PC's onboard microprocessor. This technology offers a large area of adjustment without making any permanent changes to the bikes' ECU (electronic control unit). Removing the PC returns the bike to its previous stock condition. The Power Commander can be ordered with a particular Part Pumber that is preprogrammed with a your choice of several settings, based on the modifications to your bike. The unit also comes complete with software and cable link that allows you to change between different maps or make adjustments to a map file. You can also download different programs from the DynoJet website. The PCIII USB unit includes the 9V AC consumer power adapter. A 9v battery powered adapter is sold separately. Here at the Low Discount Pricing w/ No Sales Tax! Don't see your bike model / year listed below? We've got It! Click on any bike application link and run a search for your bike. Used by Yoshimura Suzuki and their AMA Superbike Championship winning riders Mat Mladin and Ben Spies. 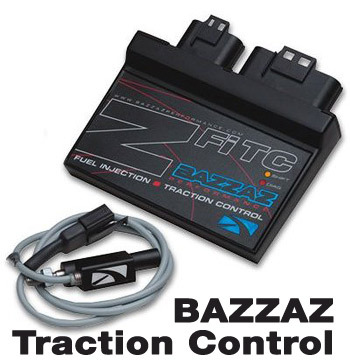 This easy clip-in module, the Z-Fi TC brings traction control technology from the highest levels of professional racing down to the average racer. The Z-Fi TC does not require any additional sensors to be mounted to the bike, and is fully legal for AMA Super Sport and Super Stock competition. Countless hours of racetrack testing and tuning were used to distill the complicated nature of this technology into a simple and intuitive tuning interface using the Z-Fi software. Traction control is easily adjusted by Throttle Position, RPM, and Gear to suit any track or riding condition. Adjustments on the fly can be made with an optional TC adjust switch, making tuning even more simple. Mikuni HSR Carbs, Arrow, Aprapovic, Riding, Racing Apparel and more! Keep your bike ready to ride!